Lump charcoal is a great option for cooking on your outdoor grill or fire pit! 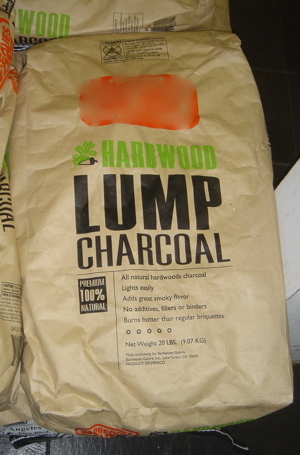 While people have been using lump hardwood charcoal and real firewood to cook with for years, it has become easier and easier to find pre-packaged lump hardwood charcoal on the market. Why is lump charcoal so great? It is made from real hardwood firewood chunks which have been charred. No chemical binders or igniting agents. No pressed composite bits of wood and organic material. Just big chunks of pure hardwood. This type of charcoal burns intensely and hot and supplies superior flavor for your grilled foods without any of the nasty chemical fumes or aromas which can come from industrial pressed composite charcoal briquets. Why not just use firewood? Firewood is another great option for outdoor cooking, especially in a fire pit or larger charcoal grill. However, real hardwood firewood takes much longer to prepare as you first have to build a large fire and let it burn to the point of having a big pile of hot embers to cook over. It also tends to burn faster and looses heat quickly if you don't keep adding wood. Real hardwood charcoal on the other hand ignites easily and quickly (see my charcoal starter and charcoal chimney pages) and provides longer burning hot embers for cooking. Adding charcoal to prolong your heat is also easy and does not result in a large wood fire which can char and burn your food while cooking. Where can I get these types of charcoal? 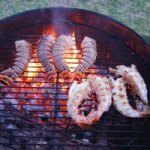 While most lump charcoals cannot be found at most supermarkets yet, they are available from most any specialty grill and barbecue shop. They are also available online although you then have to pay for shipping. Lump hardwood charcoal tends to be considerably more expensive than standard pressed briquets which you can find anywhere. However, for flavor and purity, the added price is worth it. 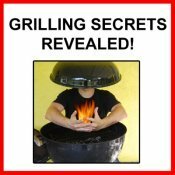 What should I look for in lump charcoal? Type of Wood - Most charcoals are made from a mixture of hardwoods like oak which have a good smokey aroma and flavor but without a distinct strong flavoring smoke. However, there are subtle difference which may be noticeable. More importantly, there are some brands which are made entirely of one strongly flavored aromatic wood such as hickory or mesquite. 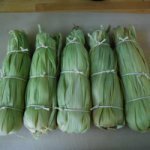 This is favorable for many grilled foods but does have a distinct aroma, so only use them if you want that distinct element in your dishes. Any charcoal can be used along with smoking wood chunks or chips to add aromatic smoke flavors to your grilled foods. Of note, some Whole Foods markets have their own brand of lump charcoal which is made entirely of recycled pieces of hardwood left over from carpentry. Many of the pieces look like a piece of floorboard or moulding. These are relatively inexpensive compared to some other brands of lump hardwood charcoal. 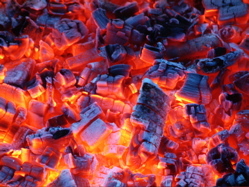 Size of charcoal pieces - Lump charcoal brands vary greatly in appearance and size depending on the quality, type of wood and source. Generally, larger pieces are more favorable as they burn hotter and longer. Some bags have only a few large pieces and the rest is small shards and smaller pieces. It may take trying a few brands available in your area before finding your favorite. Ideally, you bag would have uniform pieces of a medium to larger size. How do I use lump hardwood charcoal? Easy! Lump charcoal can be used in basically the same way as any other charcoal briquets. I like using a charcoal chimney to ignite it. The only difference I'd not is that it doesn't tend to last quite as long as pressed charcoal (mostly because of the chemicals added to those charcoals) unless you have very large chunks. 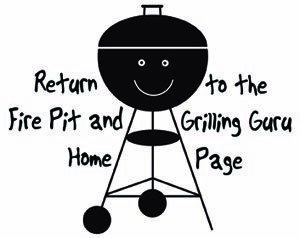 Be prepared to added more pieces of charcoal as you cook if you are planning to grill for an extended period of time. I hope lump hardwood charcoal helps bring your grilled foods to a higher level with delicious real, unprocessed wood fire flavors! Done learning about lump charcoal? Return to the All About Charcoal page.